If you are heavily involved in the food or BBQ industry, you know of the Thermapen. If you don’t know of it, you should. And let me be the person to introduce the Thermapen to you. 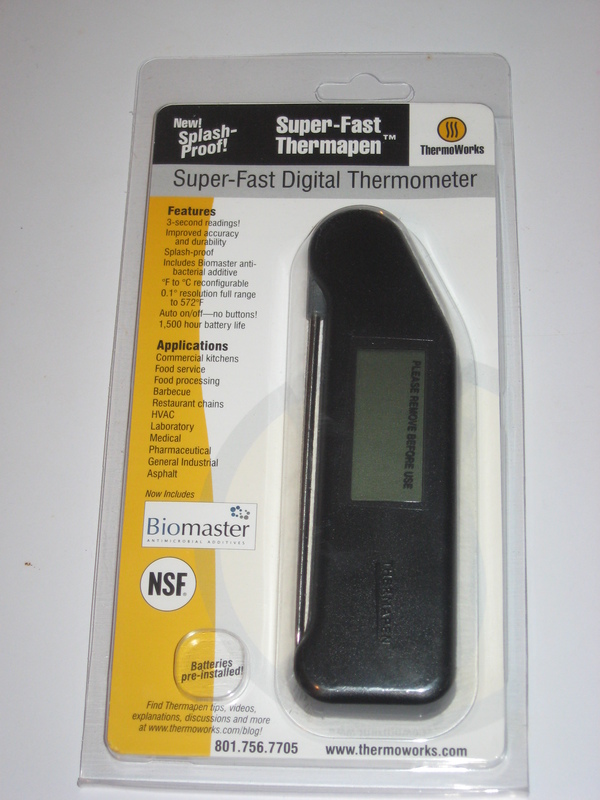 I want to give a big thank you to Jesse Black from ThermoWorks for sending me a Thermapen to review. ThermoWorks, the company behind the Thermapen, is located just south of Salt Lake City, Utah. The company’s focus is all things thermal and temperature related. Whether it’s thermometers, sensors, or even calibration equipment, you can find ThermoWorks as an industry leader. You can find their equipment not only in the food service industry, but also in other sectors such as pharmaceuticals, plastics and rubber, and road construction and repair. Estimated battery life: 1,500 hrs. Before I even start to tell about my experience using this tool, I have to say I was already impressed. 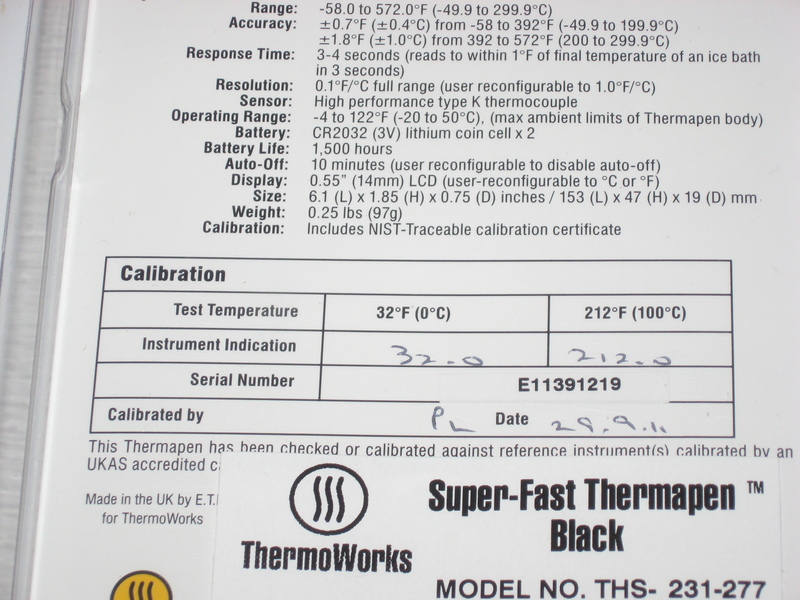 On the back part of the packaging that lists out the specifications, there was a hand-written section outlining that the particular unit I had was calibrated at 32 degrees Fahrenheit and 212 degrees Fahrenheit on September 29th. 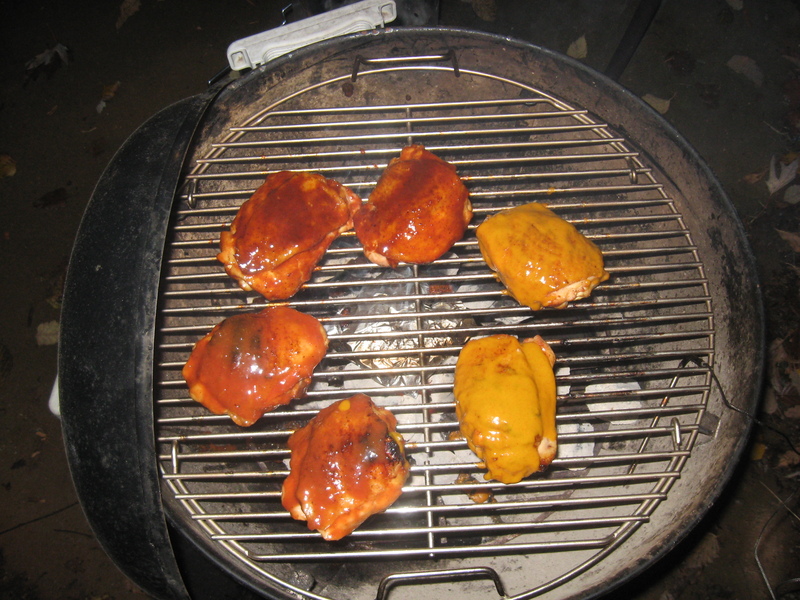 This past weekend, I took the opportunity to cook up some chicken thighs to try out a few sauces in my arsenal. As everyone knows, it’s very important to make sure that chicken is properly cooked to a minimum internal temperature of 165 degrees Fahrenheit (as recommended by the USDA). So this was the perfect opportunity to try out the Thermapen! 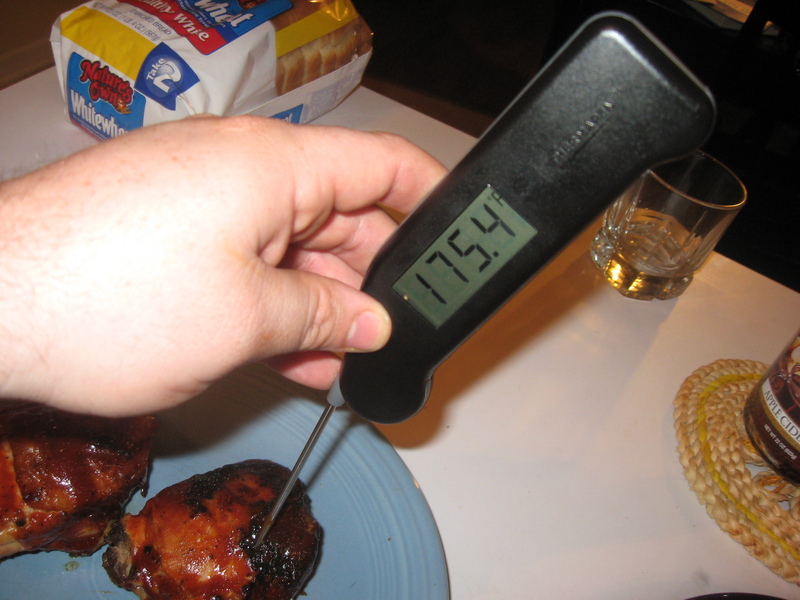 When I thought the chicken thighs were done, I pulled them off the grill, took them in, and decided to check the internal temperature using the Thermapen. The first thing I immediately noticed: it was really fast! I had an accurate reading of internal temperature in 2-3 seconds (much closer to 2). In all things grilling and BBQ, this short amount of time usually means not drastically losing cooker temperature when on a tight schedule. It was seriously easy to use — just flip open the probe to turn on the thermometer, and flip the probe closed to turn it off. The only thing that I would suggest as an improvement for this tool is to make the LCD screen backlit for viewing temperatures in the dark. And I’m not the only one to echo this sentiment. I overwhelmingly endorse the Thermapen as the standard for measuring food temperatures. The guys at ThermoWorks take their craft seriously, and it shows in the quality product they have here. While you may be able to purchase other thermometers at a lower price, you will not find the same quality in those that you will find in a Thermapen. It will make the perfect Christmas gift for the griller or BBQ pitmaster in your family! If you are interested in finding out more about the Thermapen, you can go to its product page on the ThermoWorks website. Right now ThermoWorks has prices reduced by $9 on the Thermapen, from $96 to $89.